Keep Cool of Wisconsin uses digital infrared thermal imaging (thermography) to screen for early changes in the breast. Thermal changes in the breast can be from cancer, fibrocystic changes, inflammation, hormonal imbalances, or injury. Thermography is a simple, non-invasive, no-contact, no radiation, pain-free screening procedure for women of all ages. The concept of thermography is not a new one. In 460 B.C., Hippocrates, the father of medicine, used mud on people to look for heat areas that dry faster. Thankfully, technology has come a long way. Keep Cool Thermography uses a high resolution, FDA cleared camera which is able to pick up and monitor small changes or abnormalities in the breast by analyzing blood flow. In cases of cancer, many times there will be an increase in blood flow in order to supply needed nutrients to the cancer cells.This increase in blood flow (angioneogenesis) will also create an increase in heat which is picked up by the highly sensitive camera. These areas can then be monitored by thermography and medical diagnostic testing. Thermography is performed in a temperature-controlled room. When the breast is cooled, blood vessels of normal tissue may respond by constricting to conserve heat while tumor tissue and its blood vessels may remain hot. The vascular patterns frequently associated with tumors may emit more heat than their surrounding tissues, allowing them to be detected by Keep Cool's heat sensing thermal camera. A breast thermogram will show highly specific and personal thermal patterns in each woman. They provide a unique "thermal map" that remains constant over years unless there is a change in an underlying condition. Thus, over time, it is possible to differentiate between cancers and benign conditions. Since the technology has the ability to accurately detect cancers over time, it is important to have a baseline early on in a woman's life. For this reason, women should have breast thermography performed as early as age 20. The following case studies help to illustrate the important role that breast thermography plays as an addition to a woman's regular breast health care. Below are examples of a healthy thermogram and examples of thermograms with various noted health issues. The gray images will allow the doctor to visualize the blood vessel patterns and the rainbow images will show temperature variances and "hot spots." This is an example of a healthy thermogram. She is a patien who leads a very healthy lifestyle. Notice the blood vessel patterns on the gray images. 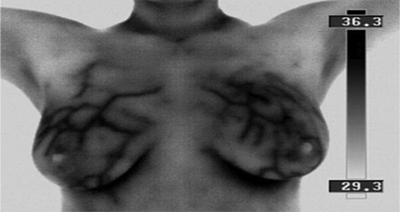 These are normal patterns and normal healthy blood flow to the breasts. Also notice the symmetry in both breasts on the rainbow image. These images were interpreted as normal heat patterns. The temperature difference between the two marked points was .88 degrees which is in a normal range of under 2.0 degrees. It is normal to see heat (red) around the neck and under the armpits. Both breasts show cool colors with no "hot spots." This patient came into my office in April 2013 after feeling a lump in her right outer breast. She had a mammogram and ultrasound which showed "suspicious of malignancy" with a recommendation by her MD to have a needle biopsy. Her thermogram report came back before her biopsy and showed "heat patterns consistent with fibrocystic changes typically associated with estrogen dominance" but no evidence of suspicious temperature increase. Basically, her mammogram and ultrasound were both suspicious for malignancy and her thermogram was not. She received her biopsy report which showed no malignancy! They were fatty tumors. She will now be working on lifestyle changes to improve her hormone balance and decrease her inflammation. Thermography is a great way to monitor you cancer treatments. This patient had 5 confirmed separate tumors in her right breast. Notice the hot red area in the left image. After three months of chemotherapy you can see the hot, red area is gone. Her treatment is going in the right direction. This is a thermogram of a woman who is pregnant. This is a perfectly normal scan. Notice the increase in vascularity as her hormones change and her breasts prepare to nourish her baby. This patient came into my office for a baseline thermogram. She never had a mammogram. She felt like her hormones were out of balance and was under quite a bit of stress. Notice the leopard spot appearance (thermal mottling) on both breasts, abdomen, chest and arms. The doctors report came back stating "these patterns are indicative of hormone imbalance and severe estrogen dominance" and a recommendation for hormonal testing. She had hormone testing done which showed dysfunction with hormones. She is making lifestyle changes to reduce her stress and balance her hormones. Estrogen dominance can be like fuel to breast cancer so it is very important to regain balance.